Discussion in 'Effects, Pedals, Strings & Things' started by toast487, Jan 24, 2012. 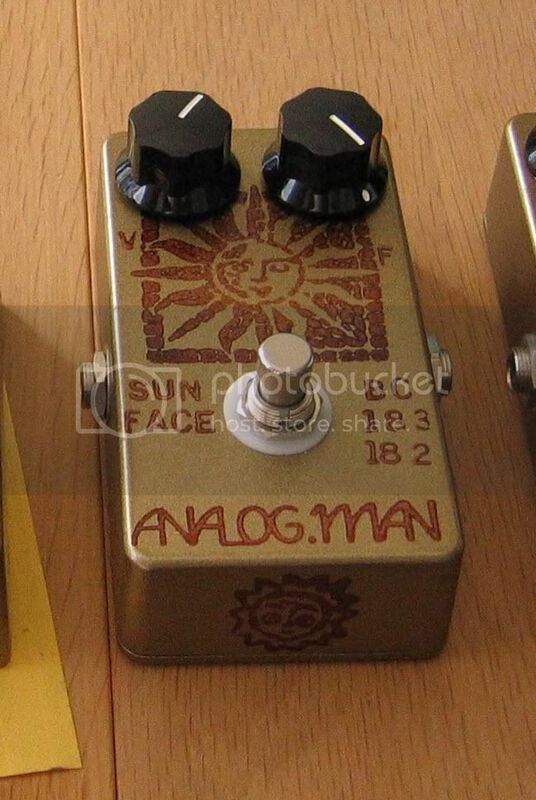 What is your favorite silicon Fuzz Face Clone? My Analogman BC182/183 Sunface is pretty amazing! I like the lunar module. Makes the improvements I want out of the Si FF. Soar leads but great for low gain rhythm too. My favorite skreddy. fuzzface6669 builds a hell of a FF. I have one of his '69 Si clones & it is all that. He builds them side by side, with the originals. Think I'll buy one. How do you compare it to the Sunface with BC108? Thanks for the good words ! Happy you like it . That original red 69 it is based off is a such a nice voiced fuzz face . You gotta check out the 72 ff replica I have been doing. That blue one is voiced very similar to the 69 one but a little darker. Kinda of a touch more Germanium kinda violin thing going for it. I got one that has a nos Arrow switch,tfk bc130c and mullard caps in it . I need to relist it soon. Sounds like E.J's live at Anaheim fuzz face. you sell these in the pedal emporium? I like fuzzfaces, but I'm not supposed to spend all my money on them. But one more is OK right. I have tried piles of the "best" fuzz face variants out there. IMO you're every bit as likely to build one yourself that sounds just as good as any of them. Got it over the MXR Fuzz and Hendrix FF because of the mids knob and internal trimmer.